Carte de la mer d'Ecosse../d'Irlande - DEPOT DE LA MARINE. Title : Carte de la mer d'Ecosse../d'Irlande. Map maker : DEPOT DE LA MARINE.. Size : 34.3 x 24.0 inches. / 87.0 x 61.0 cm. 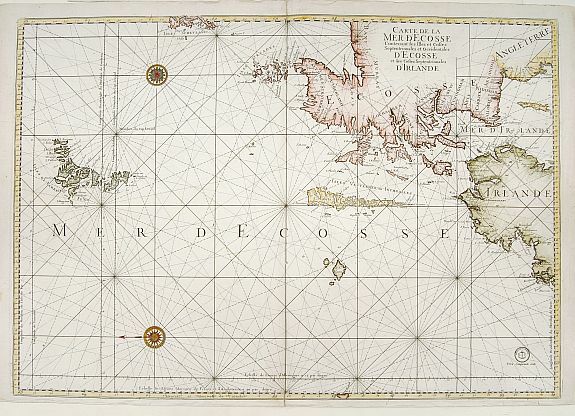 Description :Sea chart depicting northern tip of Ireland and Scotland. East to top. Condition : Papers lightly age-toned. Repair of splits lower and upper center fold. Dark impression. Generally good.